US plan-B after UN veto - deploy Al Qaeda "foreign legion." February 12, 2012 - It is now a matter of established public record that the "Libyan rebels" the US, through the UN and NATO, funded, armed, trained, recognized politically, and even provided special forces and air support for, were in fact led by the Libyan Islamic Fighting Group (LIFG), listed by the US State Department (page 1) as a "Foreign Terrorist Organization." Two West Point reports confirm that LIFG was formally joined with Al Qaeda with many of its top leaders constituting the core of Al Qaeda's upper echelons. These reports also confirm that LIFG fighters were operational in both Afghanistan and Iraq, killing US and British troops and that the vast majority of their fighters were recruited from the Libyan cities of Benghazi and Darnah. In 2011, it would be these two cities that served as the epicenter of NATO-backed resistance against Qaddafi. More recently it was exposed by French independent reporter Thierry Meyssan of VoltaireNet.org that LIFG commander Abdul Hakim Belhaj has left the NATO bombed city of Tripoli and is now directing the "Free Syrian Army" from the border of Turkey (a NATO member since 1952). In the wake of growing international anger toward Wall Street, London, and its NATO forces, led by Russia and China's vetoing of their UN Security Council resolution designed to tip off another foreign military intervention, this time in Syria, the corporate media is now reporting that Al Qaeda has called on its supporters to "join the uprising against Assad's "pernicious, cancerous regime."" We are expected to believe that Al Qaeda - allegedly depraved, beheading, civilian bombing, trade tower-toppling modern-day Huns - had pinned their hopes on the UNSC to resolve the Syrian conflict through the mechanisms of "international rule of law" and are only just now mobilizing their forces to act after the "disappointing" Russian and Chinese veto. It is a narrative as bizarre as it is contradictory. Image: G.I. 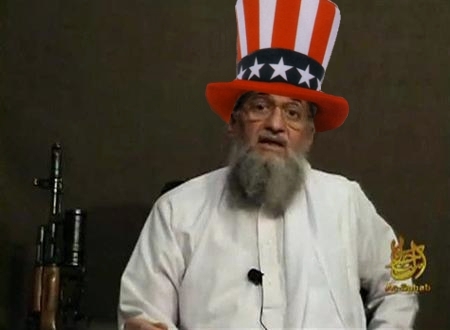 al-Zawahri: Al Qaeda leader Ayman al-Zawahri has called on Muslims from across the Arab World to mobilize and support the Syrian uprising against what he called, "Assad's pernicious, cancerous regime." Apparently he held off military involvement because he had faith in the US-backed UNSC resolution, and is only now mobilizing his forces after the "disappointing" veto - a narrative so ridiculous it can only have come from Langley, Virginia. We are also expected to believe that as large swaths of the global population begin turning against what is obviously fraudulent human rights concerns masking naked global military conquest by the West, the extremist ranks of Al Qaeda whom the West was supposedly locked in mortal combat with for over a decade are one of their few remaining allies. Considering that the West, and more specifically, the CIA, created Al Qaeda in the mountains of Afghanistan in the first place, it seems as if the terrorist organization has and still is executing US foreign policy covertly and illegally, when the US military and its NATO allies cannot. With this official endorsement by Al Qaeda of Syria's violent, foreign-funded uprising, the West can now begin blaming NATO-backed terrorism on "Al Qaeda" while simultaneously highlighting the urgency and necessity with which NATO must intervene, lest Al Qaeda terrorists fill the void. The Associated Press even made a point of mentioning that the "head of Al Qaeda" claimed Muslims across the Arab World "cannot depend on the West for help," a comment that so suspiciously compliments the howling protest of U.S. Ambassador Susan Rice recently at the UN, it seems oafishly scripted. From Afghanistan in the 1980's, to Libya in 2011, and now Syria in 2012, the one steadfast ally the US can always depend on bringing arms and militants in to carry out its foreign policy when its overstretched military cannot, is Al Qaeda, America's Arab foreign legion. This illustrates both the fraud of the West's current "human rights" agenda, as well as the ongoing hoax that is the "War on Terror."